What a fun bag to make with stunning batik fabrics!! Bali Patchwork Tote II – Purse / Bag Kit What a fun bag to make with stunning Batik fabrics! Easily pieced front has a beautiful selection of batiks inside and out. 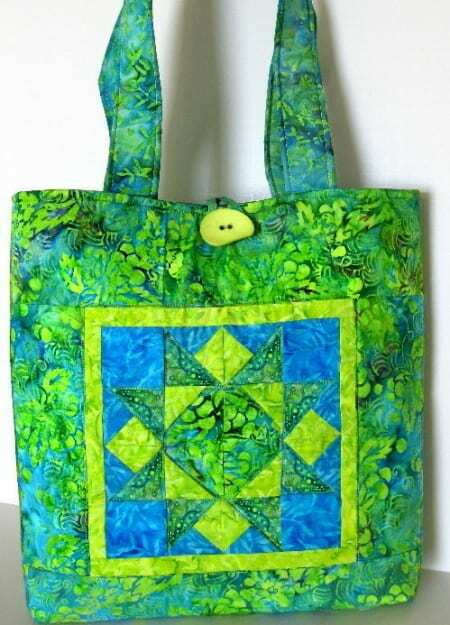 This patchwork tote bag has six large inside pockets. Easy enough for beginner sewers. Finished size: 13″ wide x 15″ tall x 4″ deep. Pockets and lining are all matching coordinated Batiks. 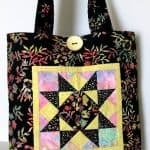 This kit includes pattern and fabric pack with all the batik fabric you need to make the patchwork tote bag exactly as shown above (also includes lining fabric, pockets and handle fabrics). 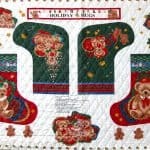 Bali Patchwork Tote I – Purse / Bag Kit Holiday Hugs Panel – Pre-QUILTED Christmas Stockings & More!